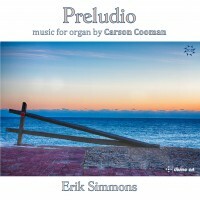 Publisher: Wayne Leupold Editions, Inc. in "Carson Cooman: Organ Music, Vol. 10"
Canzona VI (2014) is dedicated to Mark Brombaugh. In the manner of instrumental canzoni of the late 16th century, the music is in several sections, with thematic connections. In each of my keyboard canzoni, a different free approach is taken with the form. In this work, the harmonic language of the contrapuntal sections begins in the Phrygian mode, but is then extended with excursions into contemporary mixed modes.